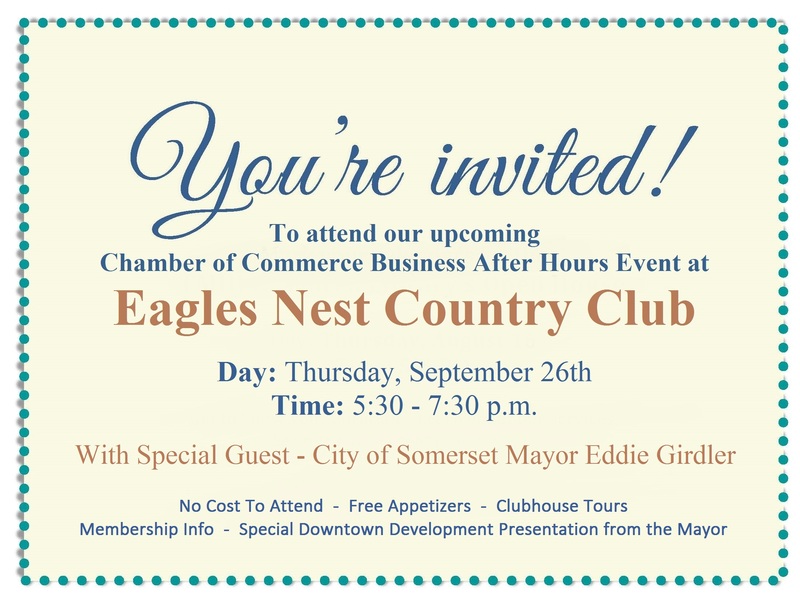 You’re cordially invited to join the Somerset-Pulaski County Chamber of Commerce for our upcoming Business After Hours event at Eagles Nest Country Club. Please join us on Thursday, September 26th at 5:30 p.m. as we will receive an update from City of Somerset Mayor Eddie Girdler on the possibility of a large-scale plan for Downtown Somerset. Eagles Nest will be providing FREE appetizers for this event. The forum is open to the general public and there is no cost to attend. The Business After Hours program is designed to create evening networking events to benefit the individual and professional growth of Chamber members. This event will be hosted at a new location each time.